As a former camp owner, I tried to eliminate injuries that could occur during the course of the summer. I hated to phone a parent a tell them that their child got hurt especially if it was preventable. The following should be considered by all camp directors to prevent injuries. Double 1st Base. Now required by many schools and Park and Recreation departments. The fielder steps on the white base and the runner steps on the orange base. This avoids a runner from running into the 1st baseman. 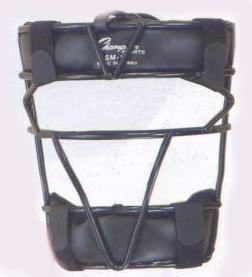 Catcher’s masks for hardball and softball. A must for all players and umpire standing behind home plate. Several models available for hardball from Umpire, Major League and Youth. 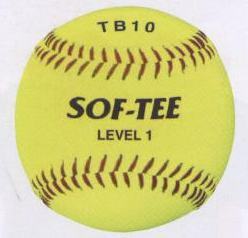 Softball model shown at left (#C-SM1)$13.20 ea. See baseball page for further info. Chest protectors for hardball. Available in several sizes, with or with tail and female model with protective cups. Check out pricing on baseball page. Fox Master Mouth guards : A must for protection ! For Soccer , Hockey, Basketball, LaCrosse etc. One size fits all. Boil and bite technology provides custom fit. We have from Jugs but shipping from West Coast runs a lot more money. 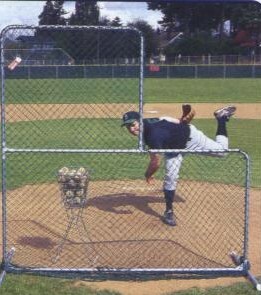 Fence Protectors; Cover dangerous chain link fencing around your ball field fences in front of dugouts. Also should be used on pool fencing. Call Check the length you need. Comes in 100 and 250 lengths. 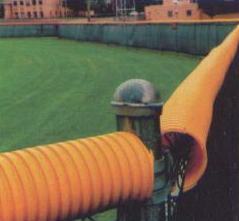 We also supply portable outfield fencing that can be removed. Check out baseball page. Pole Protectors: We need the size of your pole. Either square or if round Need circumference. You can have camp name or letters imprinted on basketball pole pads. Camp logo can also be put on pads. Call for pricing. These must be ordered at least three weeks before shipment is to be made. Imprinted $190.00+ each. If you have Goalsetter poles that have cut out for height chart, these can be made also. 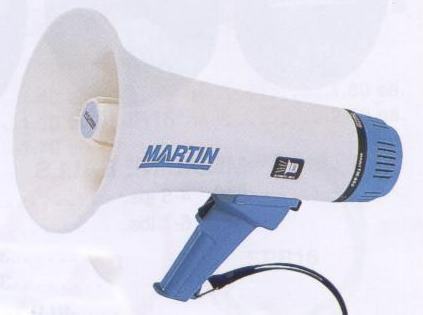 Megaphones: A must for waterfront and at times when the power goes out. Several models available from 30 yard range to 1000 yards. Volume control, siren, and strap. Check out pricing on Fun and Games page. Soccer Shin guards: Should be used for soccer and hockey players. 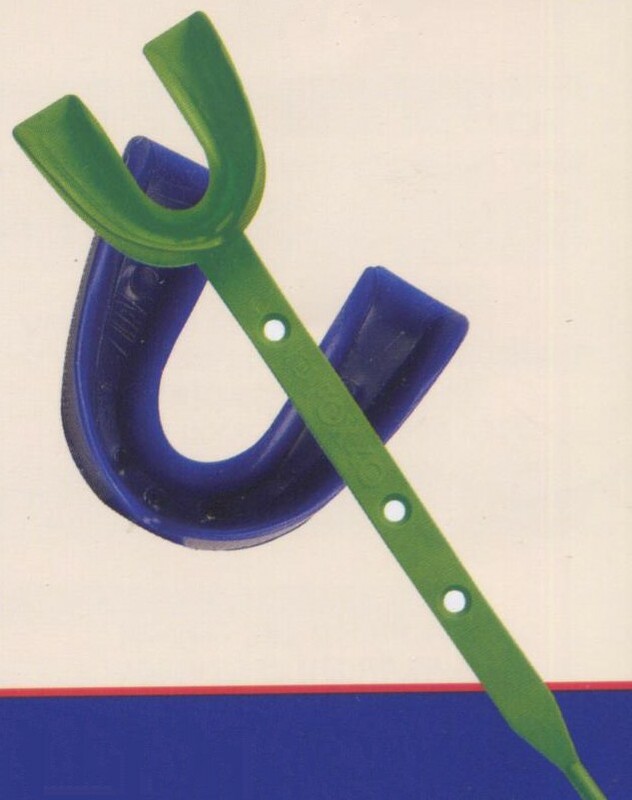 A must for waterfront personnel Easily snaps back together. Baseball Leg Protectors: are available in single knee, double knee. Some have side wings. Available in sizes for ages 7-9, 10-12, 12-16 and adult. 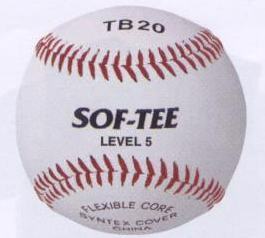 Check out prices on baseball page. Hockey Face Masks: Adult or Youth. Choice of white or Black. Minimum pack of 4 of each size. ($36.50) Buy 8, price drops. Buy 12 prices drop further. Goalie masks and goalie helmets on Hockey page. 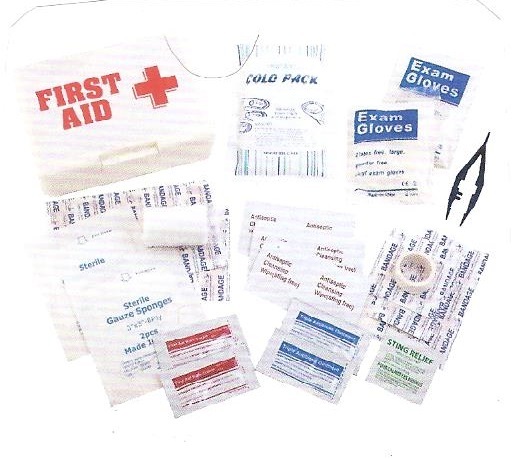 1 knuckle bandage, 1 fingertip bandage, 2 gauze pads, (3"x3") 1 conforming bandage, (2"x4.1" yds). A MUST FOR ALL VEHICLES, TRIPS, INTERCAMP, ETC. 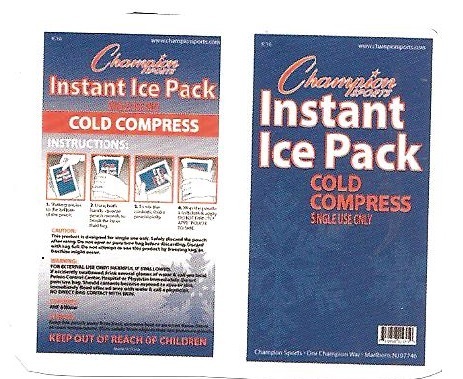 COLD PACKS (#C-IC16) Instant cold pack. 4"x9"
Other items: Whistles, traffic cones( see Fun and Games page) bath and shower room flooring ( see bathroom page). Training volleyballs, Rhino skin for Dodge ball and Gaga ( see ball page), football corner pylons for soccer fields (see football page), gymnastic mats and tumbling.